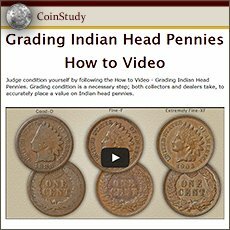 In steady demand by collectors, 1907 Indian head penny value in above average condition is double lesser grades. 1) 1907 was the largest production year of the entire series, over 108 million were minted. Your coin is among many surviving until today. With large numbers to choose from collectors place a low value on heavily worn coins. 2) Carefully judging the condition of your coin is key to discovering a valuable collectible. Finding detail remaining within the headband and feathers indicates your penny is worth many times the minimum. 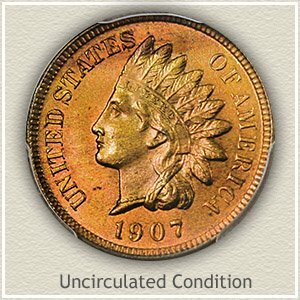 Pictured is an Gem condition "uncirculated" 1907 Indian head penny, value well above $100. This coin never entered circulation, as a result, no wear interrupts its surface. It is a close look into the bold and intricate design undisturbed by wear. All the original details remain. 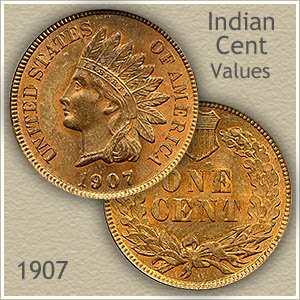 Below the value chart are images and descriptions going deeper into judging the condition of your old Indian penny. A 1907 Indian head penny is one of those years readily available in heavily worn condition. With so many minted (the largest number in any year) and at the ending of the series, large numbers remain. However, top condition examples are elusive and avidly collected. Pictured is a gem quality 1907 penny, considered one to the finest condition Indian pennies to remain. Expert care preserves the original orange-red copper color, as well as the luster imparted in the minting process. Additionally, contact with hands, other coins and the elements was minimal. Top condition examples of these old coins are infrequent to the market. When this one became available bidding at a David Lawrence rare coin auction raised gem quality 1907 Indian head penny value to $511. Multiple bids showing high interest as collectors looked to add a stunning prize to any advanced collection. Your box of old coins is worth a careful look. It is the small subtle changes in a coin’s surface causing large swings in value. Often these differences are left to a magnifying glass to discover. Compare your coin to the images accurately judging its condition. All 1907 pennies are worth a close examination. Uncirculated: Total absence of wear is required to reach the lofty "uncirculated’ grade. Original mint luster is still visible over the entire coin, often toned a pleasing brown. By tilting an uncirculated penny side to side, unbroken luster rotates across the surface. Also, inspect the high points of the design for evidence of wear. A dulling and smoothness of the surface on her eyebrow, cheek and the ends of the feathers is an indication of slight wear. Heavier wear is noticeable by flattening of normally curved contours. Extremely Fine: A 1907 Indian head penny in "extremely fine" condition is well defined in all areas of the design. Boldly rounded and separated are the hair curls and headdress ribbon below her ear. The headband remains very detailed with every letter in "Liberty" complete and sharply defined. Overall a nice coin with some light wear that does not detract from its appearance. 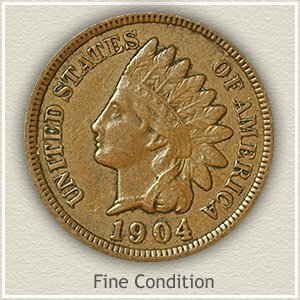 Fine: As a collectible coin, 1907 Indian head penny value in "fine" condition is generally double a lesser grade example. Moderate with ample detail defines the grade. Wear has reduced the highest details considerably but not to the point of merging one into the other. The ribbon behind her neck is still separated from the hair, although worn smooth as it crosses. All lettering of "Liberty" is visible within the headband. Good: If a coin’s surface has received extensive wear it is referred to as "good" condition. Although the portrait is very worn the bold design is clearly separate of the surface. Few details of the headdress remain, feathers are just an outline and the headband is obscured. Her facial features are very faint, the eye does have some depth and the cheek is faintly separated from her neck. If a small amount of roundness is visible to her face your 1907 Indian head penny value is slightly higher. 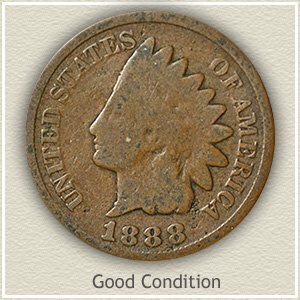 A very popular coin, the value of an Indian Head penny as a collectible is appreciated by many in the hobby. Common dates are now worth one dollar each. Today, advanced and new collectors are building collections and putting a heavy demand on not only your 1907 Indian head penny value but also the very rare dates and better condition coins. Compare your coins to the values chart. Accurate penny values are found by using grading images and descriptions to judge the condition of your coins. Next, check the date and values on the charts covering each series of US pennies. Discover all the rare varieties, dates and mintmarks combinations.